On my last visit to Haifa back in 2014, I spent the day touring the Baha’i Gardens and wandering the streets of the Carmel neighborhood, but I have since discovered that the city has plenty more to offer in its repertoire. In recent years, work has commenced to revitalize sections of Haifa, Israel’s third most populated city, specifically within its downtown region, to inject new life into this industrialized segment of town. The closest area to Haifa’s 11th century AD port, this section of the city is experiencing tremendous developments and burgeoning visitors and locals, through its gentrification of an urban pedestrian hub presenting upscale dining, drinking and flourishing artistic compounds. 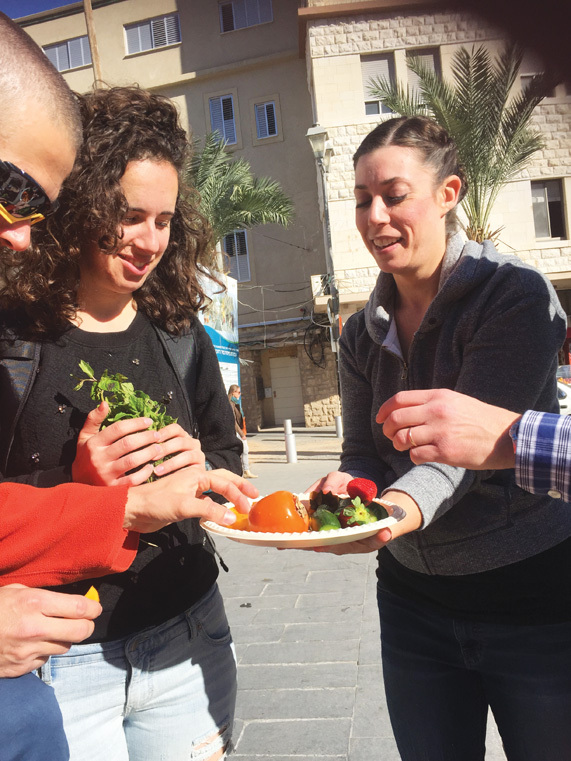 In April, I was invited on a Haifa Street Food Tour run by Jessica Halfin, US born, now half-Israeli, who moved to the country a decade ago, and has since settled in Haifa. She has established herself as a local food expert and launched the tailor-made walking tour a year and a half ago with an objective to showcase authentic street food establishments across the city. Next we stroll a short way to Borekas Bachar HaAgala, a humble Turkish, family-run business preparing fresh böreks from scratch, rolled and filled before an audience and stuffed with rich fillings of salty cheeses, potato or mushrooms and served with a roasted egg, pickles and zaatar seasoning. The café is brimming with regulars, who wave knowingly to the owner as they tuck into their hearty lunches; a welcoming snapshot of old-style Haifa. Soon after, we zig zag our way through the revived Jaffa Road and Nathanson compound, a pedestrian complex peppered with traditional murals depicting scenes from its old market. Making our way to Paris Square, a public area erected during the Ottoman era, we select fruit from local small market store Gan HaMelech, and chow down on freshly sliced mandarin orange, loquat, ground cucumber (Fakus in Hebrew and Arabic)), dragon fruit and strawberries, a much-appreciated palette cleanser. A short walk from Paris Square, we take a seat at Hummus Eliyah on Shivat Tzion St, a local chain scattered across Israel. The hummus is blended into a perfect cream before our eyes, made from cooked chick peas, tahini sauce, mashed broad beans and black olives, topped with paprika, cumin, parsley and olive oil. The warm doughy pita is perfect for “wiping the bowl down,” one of many traditional ways to consume the spread, which was followed by aromatic Turkish coffee. Other scheduled spots included dining with the locals at Shawarma Emil, where fresh market meat is served with cauliflower pickles, tahini and pickled mango sauce; a taste of healthy green falafel smothered in tahini at HaWadi Mishel; and a visit to Maafiat HaBankim, a hole-in-the-wall bakery on 6 HaBankim St., with an alluring display of freshly baked goods. My personal highlight was Bakery of the East on Allenby Rd., where an assortment of moist and moreish baklava, sweet shredded wheat pastry with goat cheese (knafe), semolina cake (basbusa), and halva (a sweet sesame treat) was placed before us, each bite more delicious than the next. The tour concluded at Haifa Port, a district where fine dining and niche eateries are making their mark. At Morel World Tapas and Wine we sipped on a refreshing glass of 2015 white Vortman wine from Shfeya Valley, a sublime way to end a tour that blends local tastes, insightful culture and social interaction into a delightful experiential recipe.